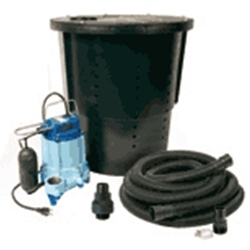 An ideal solution to help prevent water and moisture from collecting in the low areas of your crawl space. Removing this moisture aids in prevention of mold and fungus which causes allergies and odors, as well as moisture damage to wood floors, insulation and metal ductwork. Also helps minimize structural damage from freezing water which can cause your foundation to buckle. The CS-SS can also be used to help prevent water from standing in low lying problem areas such as yard, patio, driveway and other areas around your home.